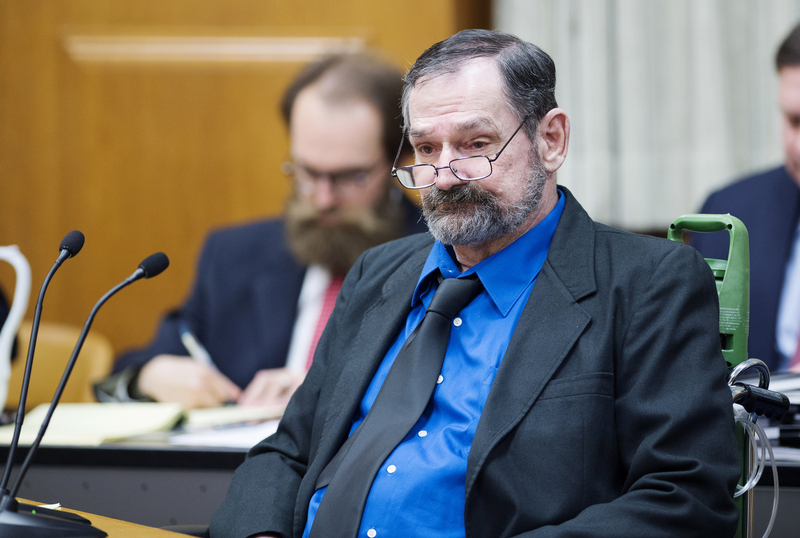 OLATHE, Kan. - The man who admitted killing three people at two suburban Kansas City-area Jewish sites was convicted of murder and other charges Monday, shortly after he told jurors he hoped to "die as a martyr" for the shootings. It took the jury of seven men and five women just over two hours to find Frazier Glenn Miller guilty of one count of capital murder, three counts of attempted murder and assault and weapons charges. After the verdict was announced, Miller, 74, of Aurora, Missouri, said: "The fat lady just sang." As jurors were filing out of the courtroom, he told them: "You probably won't sleep tonight." CBS Kansas City affiliate KCTV reports that Miller also gave the Nazi salute as jurors left the room, prompting the judge to admonish him. Miller said he was disappointed and the verdict ruined his day, reports the station. Next, the jury will deliberate the sentence for Miller, who could face the death penalty. Miller had been representing himself after firing his lawyers in May. During the prosecution's closing, District Attorney Steve Howe cited a "mountain of evidence" against Miller, who was charged with capital murder in the April 2014 shootings at two Jewish sites in Overland Park, Kansas. Although he has admitted to killing the three people, he pleaded not guilty, saying it was his duty to stop genocide against the white race. None of the victims were Jewish. "He wants to be the one who decides who lives and dies," Howe said of Miller. The Passover eve shootings killed William Corporon, 69, Corporon's 14-year-old grandson, Reat Griffin Underwood, at the Jewish Community Center in Overland Park, and Terri LaManno, 53, at the nearby Village Shalom retirement center. During his closing, Miller said he had been "floating on a cloud" since the killings. Earlier, he objected when Howe alleged he wanted to kill as many people as possible. Miller interjected: "I wanted to kill Jews, not people." Miller urged jurors to "show great courage" and find him not guilty. "You have the power in your hands to inspire the world," he said. "You can become a man or woman your forefathers will be proud of for your bravery." The proceedings were marked with frequent outbursts from Miller, who objected repeatedly while jurors were out of the courtroom during discussions about what instructions should guide deliberations. At one point, he said, "I object to everything on the grounds of George Washington, our founding father." The objections became so heated that Judge Thomas Kelly Ryan temporarily ejected Miller from the courtroom when Miller said he didn't respect the process and used an anti-Semitic comment to criticize the court system. Ryan told Miller that if there were further outbursts, he would permanently eject him or declare a mistrial. Miller groused before finally agreeing, "I will take it under advisement and try to improve."